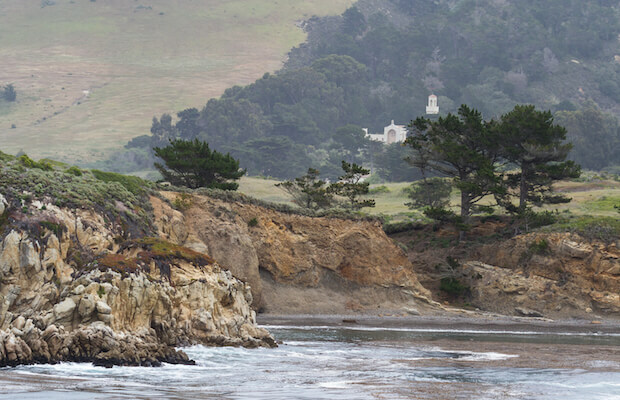 Carmel or Carmel-by-the-Sea is located south of Monterey and north of Big Sur. Carmel has a long history of being an artistic community and has become one of the top California vacation destinations in recent years. This is largely because Carmel-by-the-Sea is more reminiscent of a European style village than a town in Southern California. If you’re headed to Carmel, a car service can help get there. Main Event Transportation can provide car services to Carmel and airport transportation to San Francisco. Main Event Transportation can also be your any event transportation in Carmel, we provide Carmel wedding limo services, party limousines, and more! Reserve a limousine service today! Carmel-by-the-Sea features a variety of fine dining restaurants, boutique shopping, art galleries, and spas. There are loads of things to do in Carmel including Mazda Raceway, Big Sur, Point Lobos State Reserve, Old Fisherman’s Warf, Cannery Row, and Pebble Beach. Main Event Transportation provides limousine services to these and many more. We offer premium car services throughout Carmel, Carmel Valley, and Carmel Highlands, from limos to sedans to airport vans! We have limousines and luxury sedans for any occasion. Visit our travel guide to find out more things to do in Carmel. Whether you're vacationing from San Francisco or need a ride to or from SFO airport, our Carmel car services are ready to serve. We provide private airport limousines to San Francisco International Airport or San Jose International Airport and Carmel. Our passenger vans and executive coaches in Carmel are ideal for group transportation to SFO, and more. Book your next airport car service with Main Event Transportation! Main Event Transportation offers a variety of car services to Carmel-by-the-Sea: wedding limousines, corporate transportation, wine tours, and airport vans. We can match your travel needs with our selection of town cars, SUVs, limos, passenger vans, and coaches. Make your next event a special one with Carmel limousine and coach transportation. Book your next limo service in Carmel-by-the-Sea with Main Event Transportation. Carmel wedding limousines, executive shuttles, and more!